Not your father's beach ball. This beach ball features an interesting rainbow full of colors. Beach balls sold deflated. FUN IN THE SUN! Super sized beach balls for superb fun! Classic and beloved by all, these beach balls are iconic with summer fun! Scatter them around as party decorations or hand them out to guests as party favors. BEACH AND POOL FUN! Weather you're hosting a beach party or Hawaiian luau, hand out these pool toys as fun party favors that are sure to keep the party going. BULK PACK OF 12! Going to the beach or the pool just isn't the same without a classic beach ball so make sure you have enough of these on hand! INFLATABLE UP TO 16"! 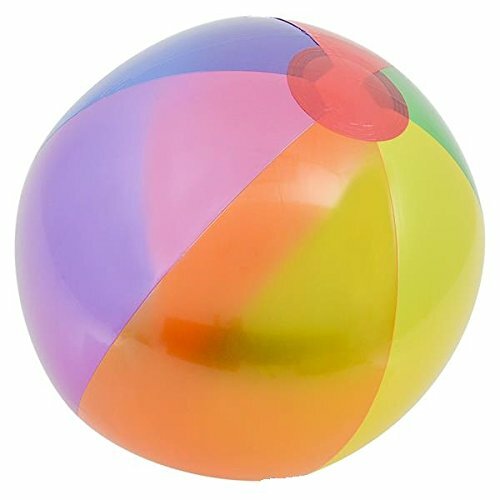 These beach balls are fun for kids and adults alike. Assorted primary colors striped design. HIGH QUALITY AND DURABLE! Child Tested Inflatable Beach Balls made of highest quality material. Backed by our 100% money back guarantee.